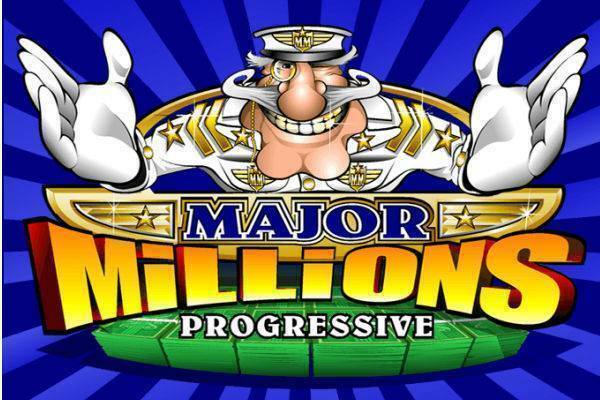 Microgaming’s Major Millions Progressive 5-reel, 15-payline, 15-coin slot updates a classic 3-reel fruit machine version of the game to something more contemporary. The game features a wild multiplier and a scatter multiplier. But the main attraction is a fighting chance to land 5 wilds on the 15th payline, possibly winning you a six-figure or even millionaire-maker jackpot, progressively growing with each bet on the game from its players. To have a chance of winning it, you need to wager at max bet of £3 and all 15 betlines, hoping that the 5-star Major will favour you with a big win. You decide if a 7-figure jackpot justifies wagering on a game with a RTP mired below 90%. The betting controls are under the reels. Coin value is fixed at 20p, and you can bet up to 15 coins, on up to 15 paylines, so this game may appeal to budget bettors as well as those with a big bankroll. Max Bet will up your stake to the maximum, a requirement if you hope to compete for the jackpot. There are also “expert” autoplay options, with a wide variety of ways to let it ride. The wild symbol is the Major Millions Progressive logo. It replaces all other symbols except the scatter and will triple your wins. Get 5, however, and enjoy a stratospheric win of 8000x stake. The scatter symbol is red lettered and adorned with gold coins and diamonds. You need at least 3 anywhere on the reels. Land 5 and you can add to your payline win by a 50x of your staked credits. The amount of the jackpot shows above the reels in bright red numbers. The classic 3-reel version of this slot was the first in history to deliver a jackpot worth one million pounds. Of course, that figure has been since surpassed many times over by other slots, but Major Millions still holds its own. While average wins hover around £500,000, there are no lack of million-plus jackpots. In fact, they occur roughly every 6 weeks or so. The maximum win topped £2 million. The jackpot seeds at around £200,000. To improve your chances of winning big, wait till it tops £500,000. Remember: to have a shot at the big money, you must go for the maximum bet of £3. To win the jackpot, you need to land the game logo wild on all five reels of the 15th payline. This slot does not have special features, but it makes attractive and generous use of multipliers in both its wild and scatter symbols. If you’re a lover of military parades and regalia, you will get a kick out of this theme. Prepare to go to war with the firm-jawed Major Millions leading the way. There are all kids of weapons and all kinds of vessels from air and sea as well as more arcane symbols like top secret files, binoculars and of course medals. There are some simple animations to add some life. The sounds and background music also evoke martial combat, with wins celebrated with a military drumbeat and jackpots wins accompanied by the cheers you might hear in a victorious military parade. 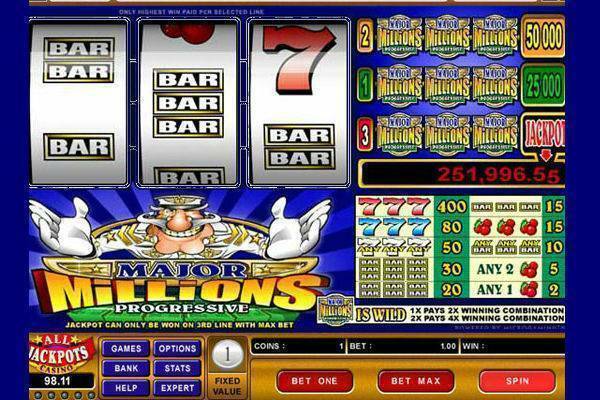 Major Millions is a 5-reel, 15-payline, 15-coin slot from Microgaming that takes you on a military campaign to win big money. While its RTP is a submarine lurking below the water at less than 90%, the jackpot that has been known to reach above £2,000,000 may lure you into combat again and again in hopes of emerging victorious. Perhaps you might just prove to be the next winner in the battle for the jackpot.